The Croatian city of Šibenik was founded over 1000 years ago, and is considered to be the gateway to the Kornati Islands. Located in central Dalmatia, Šibenik has a historic core and a plethora of stunning architecture and landmarks for you to discover and enjoy. It’s home to one of the largest Gothic-Renaissance cathedrals in the region. St James’ Cathedral is constructed entirely from stone that is quarried on the islands of Korčula and Brač, and is very much the city’s crowning architectural glory. Although closed to the public, St John’s Church boasts classic 15th century Gothic-Renaissance architecture that you can admire from the exterior. The best way to explore the beauty, history, heritage and culture of Šibenik is on a guided walking tour. Meander through the labyrinth of steep backstreets and narrow alleyways to discover hidden gems. 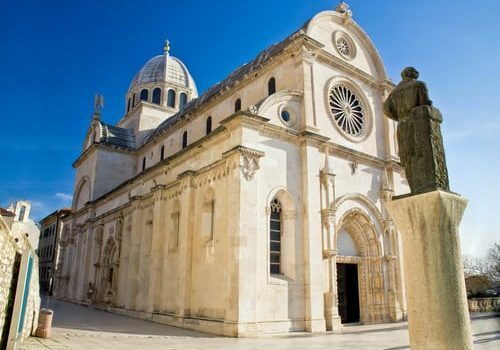 Visit the Šibenik City Museum, located within the 17th century Rector’s Palace, and admire the permanent collection of antiquities that date from prehistory to the Venetian period. Explore the 13th century St Michael’s Fortress, and clamber to the top of the fortified battlements to feast your eyes on the best views over the city and Krk River. 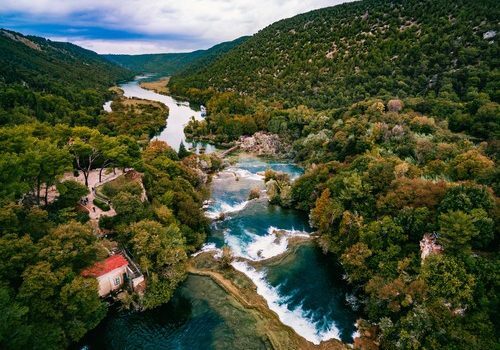 As Šibenik provides a direct access point to the popular tourist attractions of the national parks of Krka and Kornati, you can easily venture outside of the city on a sightseeing day trip. If you prefer to explore the natural beauty in the city, head for the Medieval Monastery Mediterranean Garden. The stunning award-winning formal layout garden is the work of landscape artist Dragutin Kis, and features a combination of herbs and medicinal plants. Wander along the neat paths that are shaped like a cross, and admire the fragrant display. On-site, there is a little café where you can relax and enjoy delicious cakes and ice cream. 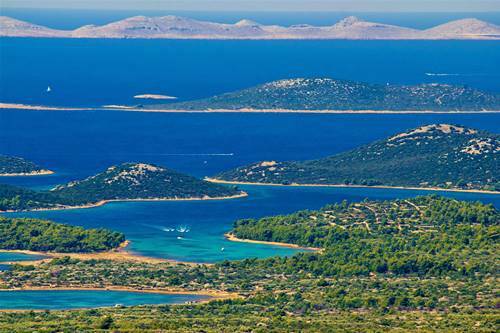 Widely recognised as a ‘nautical paradise’, Kornati National Park comprises of 89 islands, islets and reefs that you can explore at leisure. The beautiful indented coastline boasts a wealth of living marine ecosystems, and there are also plenty of caves, grottos and rugged cliffs to explore. Go in search of an idyllic bay where you can relax and enjoy the breathtaking scenery. Once you have explored the landscape, take to the shimmering aquamarine waters to enjoy a diving or snorkelling experience. Šibenik is home to many fine examples of stunning architecture. One of its most admired landmarks is the magnificent Cathedral of St James. Between the 15th and 16th centuries it took three architects in succession to design and direct the construction of the iconic cathedral. The cathedral’s structure is entirely made of stone and features unique building techniques for the vaulting and dome. Inside, you will discover a remarkable frieze that is decorated with 71 sculptured faces of men, women and children. Enjoy an exciting day trip to Krka National Park. The popular tourist attraction and natural beauty spot boasts lakes, gorges and seven waterfalls. It also has a river that gushes through a karstic canyon that is 200m deep. Admire the spectacular Skradinski Buk, and follow the winding trail to the stunning cascades of Roski Slap. Hop aboard a boat for a ride to Visovac Island, where you can visit and explore the 15th century Franciscan Monastery of Our Lady of Mercy. Enjoy an authentic Šibenik dining experience at Restaurant Tomaseo. The modern restaurant is the place to go if you want to eat lunch whilst admiring stunning views. The interior is spacious and airy, with elegant white tablecloth covered tables and large floor to ceiling windows. On the menu are pasta dishes, seafood, meat dishes, and risotto. If you have a sweet tooth, spoil yourself by ordering one of the best desserts in the city. The restaurant also has an extensive wine list. 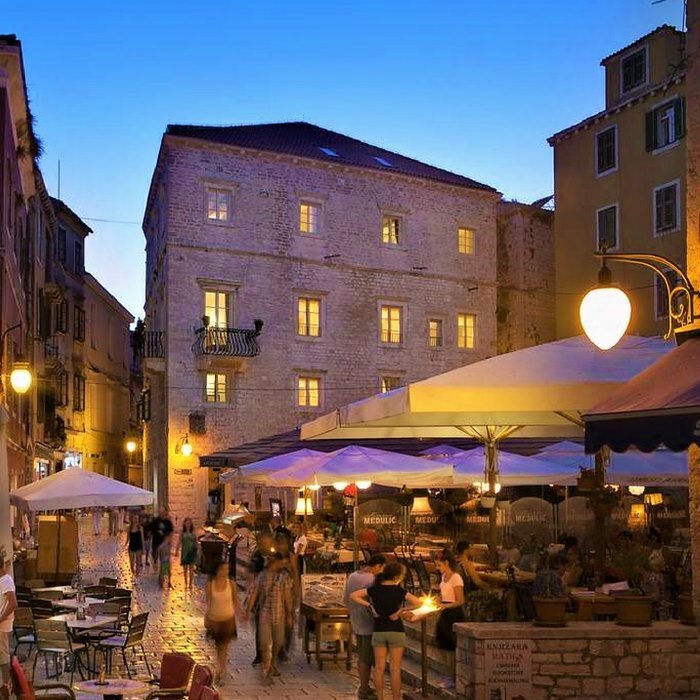 A beautifully renovated palace in the heart of Šibenik, offering luxurious rooms, a hot tub and sauna, and a wonderful café & patisserie serving the finest gastronomic delights.